In many parts of the country, hobby stores have setup indoor crawling courses so that their customers can crawl year round. This is, of course, great, but crawling indoors can be radically different than outdoors. 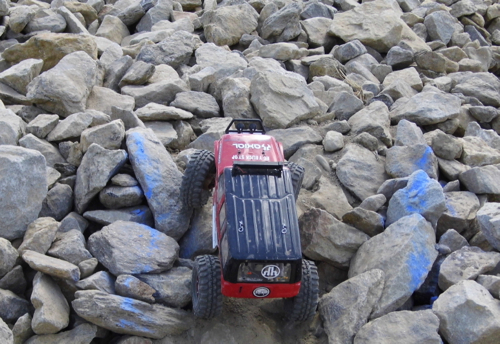 There are two basic types of indoor rock crawling courses. One is made out of actual rocks placed indoors. The second type is simulated rock. Both present different challenges. The courses made out of rocks moved indoors are usually a large collection of many smaller rocks ranging from baseball-sized to rocks about the size of basketballs. Some courses may have some bigger rocks, but that’s fairly rare, as the smaller the rocks are easier to get indoors. Piles of small rocks are very different than large exposed rocks found outdoors. The problem is all of the gaps and holes created between all of the rocks. When navigating these courses, the vehicle’s tires are constantly dropping in these holes. This can be brutal on the vehicles. When tires fall in these holes and get bound up, the suspension and especially the drivetrain take a real beating. Extremely careful line selection is needed to avoid as many of these holes as possible. A suspension setup with less articulation–specifically droop or down travel–will also make a huge difference as the tires will be less likely to fall in holes. Less droop will make the tires more likely to glide over the gaps between rocks. You can fabricate function limiting straps out of items such as shoelaces or cable ties. You don’t want to take away all of your suspension’s functionality, but limiting droop will often considerably help on many indoor rock crawling courses. Another type of indoor course is the manmade type that is often fabricated out of spray foam insulation that goes on as a sprayed foam and then expands and hardens. When painted, this can made for some very realistic terrain. The hardest part about adapting to this surface is coping with inconsistent traction, which is pretty common outdoors as well. The difference is outdoors you can see the difference in terrain. If you’re paying attention, you know if you’re on sand, rock, smooth rock, etc. and can change your driving style to suit. On these manmade foam courses, you often can’t see how the surface is wearing. Sometimes you can see the paint or bed liner coating that is often used completely worn off, but often it looks the same but is completely smooth. Keep in mind too much traction can often hurt your efforts a lot more than too little traction. When traction is low, you slip and slide. That can be a struggle, but you can often just keep trying. When you unexpectedly encounter too much traction on a climb, your rear tires can bite in and flip you over backwards. The key is to keep a careful watch on not just the obstacles in your path but also the terrain’s surface. With both types of indoor courses one of the best things you can do is pre-walk the course. You don’t need to actually walk on the course, but you should walk along the course and envision your planned line. In your head, picture your vehicle as it goes and predict where you find difficulty. Really examine the course for tire-grabbing holes and look for smooth and rough surfaces that could present problems. Even if you put all of your Axial Racing vehicles away for the winter, you may find the temptation to try to tackle some axle-deep snow or the urge to slide around on some slick ice too much to take. As such, you may find yourself charging batteries and bundling up in your snow gear before you know it. You know how to get yourself ready for the cold, but you may not know how to get your Axial rig ready for cold weather. Word of caution: all the rules that apply to water apply to snow. If your electronics aren’t protected for water, they aren’t protected for snow. Also, water and snow damage isn’t limited to electronics. Read this post to learn more about the damage water can cause here. Snow can stick like glue. It collects in wheels and in the chassis. It will stick to the axles and the bottom of the chassis. It can fill the body. This snow can cause hardware to corrode. Axial uses high-quality hardware that has a protective finish, but between normal wear and moisture, the hardware can still rust. The solution is twofold. First, coating the bottom of the chassis and axles with WD-40 will both ease the amount of the snow that sticks and help prevent corrosion. There are other products similar to WD-40, but WD-40 is inexpensive and easy to find. The second part is a good cleaning. Drip drying under your work bench is not a good cleaning method. Remove the body and brush away the snow. Some cheap stiff bristled paint brushes work perfectly for this. A tooth brush also helps. Remove the wheels and wipe down the axles with some WD-40. Also wipe down any exposed metal hardware. This will prevent corrosion. Batteries do not perform well in extreme temperatures. The key is to charge the packs fully and to keep them indoors until ready for use and to immediately remove them when done running. Dry the packs and keep them indoors. Keep in mind that temperatures can impact the voltage of a battery, so don’t over drain a LiPo pack. Stop running well before your LiPo cutoff kicks in. One of the best benefits of driving in the cold comes from driving on ice. If you have a Yeti and live in an area that has frozen water, you are in for a great driving lesson. First, make sure you have absolute confirmation that the ice is safe. Just because you’ve seen someone walk it doesn’t mean the ice is safe. Get absolute confirmation. When you drive a fast vehicle like the Yeti on slick ice, you will quickly learn how to counter steer. This will make you an awesome driver. You also learn how to properly start and stop. One of the most important things to know about cold weather driving is that plastic gets less flexible and more brittle as temperatures drop. 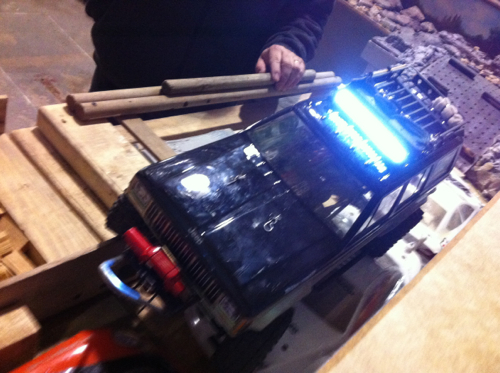 Even the composite plastics used in Axial vehicles can be susceptible to damage in extremely cold temperatures. What may not cause any damage in warm temperatures could cause a parts failure when temperatures are cold. The solution is to drive more cautiously. Take fewer risks, drive a little slower and try to avoid collisions.